Measurements are 2460mm wide x 1820mm tall x 505mm deep. These are the outer dimensions of the bay including the corner post arrangements. 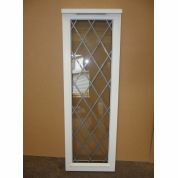 Plain Casement square 90° bay window. On the front section, the outer casements have side openers with top vents above. On the returns, just the top vents open. All the rest are dummy non-opening casements which keep all the glass lines running through for a better visual appearance. Secured by Design specification, with higher security multipoint locks and glass described below. 24mm double glazed units, the outer pane being 6.8mm optilam laminate and a 4mm low E toughened inner pane and a 14mm silver spacer, argon filled. The outer pane of Pilkington Optilam which is ideal for providing both impact resistance and security since it may break on impact, but the glass is held in place by a polyvinylbutyral interlayer, thus preventing injury or intrusion. This contributes to the Secured by Design spec of the window. Softwood window, pre-finished in white. At your discretion you may want to apply a new finishing coat. NOTE ON DELIVERY: Just the large front section of this is 140kg in weight, so on delivery there must be a minimum of 2 people to assist in unloading. The delivery is a one man service.